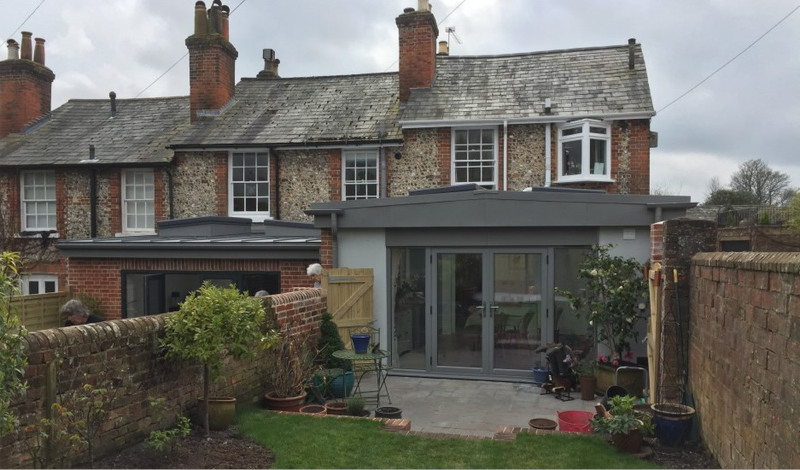 The proposal involves the demolition of a single storey rear extension that did not provide a good connection to the garden or utilise the space in the best way possible. The new proposal provides a full width rear extension with large glass sliding doors. The roof is to be constructed from zinc and will provide a contemporary extension against the character of the existing brick and flint cottage. 2 sky lanterns push natural light into the core of the new extension to create a more open and light environment with a better connection to the garden. The project was granted planning permission in January 2016 and works will start on site in June, along with the adjoining neighbours extension which are to be completed by the same Contractor. Studio Four oversaw both projects on site and the majority of the works were completed at the end of 2016 with some outstanding external works due to complete in spring 2017.